The National Industry and Information Conference took place in Beijing on 27 Dec, 2013. The meeting stressed the need to promote information-driven consumption in the coming year, including quickened pace of 4G development, which would see commercial 4G coverage in over 300 cities by end 2014 with a user base of over 30 million. Obtaining the 4G license is a huge development for telecommunication players, equipment manufacturers, mobile phone makers, and related Internet companies. MIIT and the Chinese Academy of Science used to predict the initial phase of 4G infrastructure build up may generate an investment of 500 billion yuan. With the commercial coverage in place, the 4G wave would extend to up-and-down-stream industries as well as the mobile Internet. The ICT industry may see a sea change, including tremendous impacts on OS, chips, smart gadgets, and related applications. The total value of the 4G market may well exceed 1 trillion yuan. “This is a tremendous opportunity window,” said a senior official with MIIT to People’s Daily reporter Wang Zheng in an interview. “Quickened pace of 4G development is strategically crucial for information-driven consumption (as part of overall domestic consumption) and the national innovation strategy.” The 4G wave provides higher speed connection, reduced delay, and overall lower cost, and therefore promotes mobile connectivity, according to the MIIT official. Mobile users will be able to have a better high-speed connection experience, and possibilities of mobile internet business are just huge. Applications to benefit from the 4G wave include mobile productivity, e-commerce, logistics, and smart home, among others. Many more emerging businesses and services may grow leveraging the new available 4G connection. In China, major market opportunities in the areas of applications, smart end equipment, OS, and chips, roughly covering a whole supply chain of innovation and technological breakthrough. “The deployment of 4G technologies will effectively promote industry growth,” said the MIIT official. “One, the 4G infrastructure build up involves huge procurement of network equipment, not to say further upgrading of the equipment. This will strongly stimulate the technological growth of equipment makers in China. Two, new mobile phones and devices will emerge, promoting the development of mobile device manufacturers, who will compete to provide better and more sophisticated products. Three, with higher-speed connectivity, software providers will try and develop better apps, thus promoting better service,” added the official. This is the very eve of wide 4G adoption. Electronic manufacturers and end device makers are all preparing for a big wave of manufacturing activity. NEPCON China 2014 to take place on 23 April, 2014, will focus the highlight on 4G equipment manufacturing and 4G applications. While the heat of infrastructure buildup during the 3G deployment is still there, the three major telecommunications operators in China are unleashing a new wave of buildup for 4G infrastructure, including huge numbers of base stations to be built up. Given the huge market potentials, the telecommunications equipment makers have already begun heated competition in the area of 4G LTE. According to industry insiders, 4G base stations will be built even more densely than 3G counterparts. In total, there may emerge over 1.4 million 4G base stations. The Chinese operators are set to fully launch 4G service within the year. Major telecommunications equipment makers – Ericsson, Huawei, among other – just cannot wait for the big feast, all vying for a bigger part of it. 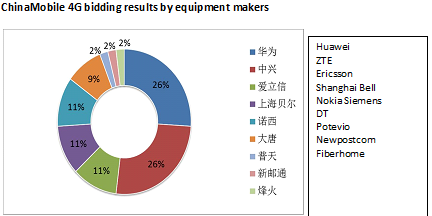 Huawei and ZTE led in the TDD-LTE procurement bidding by ChinaMobile (26% each), followed by Ericsson, Shanghai Bell and Nokia Siemens (11% each). A quickened pace of 4G commercial deployment is under way globally. Beginning by end 2013, China has seen a bigger wave of 4G deployment with the issuing of licenses to major operators. The year 2014 marks a crucial year to gain market shares. In the 3G era, the Chinese telecommunications equipment makers managed to grow rapidly, and some among the top 5 global players. Huawei revenue was even bigger than that of Ericsson, a long-time No. 1 of the industry. In the 4G era, the Chinese equipment makers are starting in a better position to achieve big in the biggest telecommunications market of the world. Telecommunications equipment makers home and abroad are fighting to get a foothold in the Chinese 4G market, including major investment into TD and FDD while more, bigger investment is coming. 4G offers even bigger opportunities to equipment makers, bigger than the 2G and 3G eras. According to analysts, with the scale up of 4G infrastructure buildup, the global telecommunications equipment industry is expected to gradually recover following 2013, and steady growth is predicted for the next few years. Apart from the biggest 4G procurement feast offered by ChinaMobile, further bidding to be initiated by China Telecom and China Unicom are both huge opportunities for the global equipment makers. The 4G wave is just beginning. Now the investment concentrates on infrastructure. Mobile phones and other consumer devices are yet to see their share of procurement. The mobile phone makers are starting to maneuver for the hypercompetition to come. On the whole, there are not yet so many mobile phone makers in the 4G R&D scene – only 11 players are in. A huge wave of mobile phone replacement may well start in the next year, providing a huge boost for the makers. To make sure TD-LTE spec phones are able to roam in most 3G/4G networks overseas, ChinaMobile requires at least 5 mode/10 band specs and even more stringent in an effort to ensure better compatibility. That is to say, a mobile phone will have to support five modes – LTE-TDD,TD-SCDMA,GSM,TE FDD, and WCDMA – as well as ten band LTE. According to Xi Guohua, China Mobile Chair, who spoke at the global partners conference in Guangzhou in end 2013, the company would sell more than 100 million TD-LET end devices in 2014. Also, the company would provide even bigger subsidy for end device makers in 2013, given the subsidy in 2013 at 27 billion yuan. According to TCL COO and China Sales President Wang Jiyang, over 60% TCL phones sold overseas will be 4G products in 2014, while in China 4G products will account for more than half. “In 2014, 4G shipment will account for one third of the total,” said Wang Jiyang. TCL will closely follow the moves by the three major operators, while China Mobile planned LTE shipment will account for 50% of the total in China. “TD-LTE smart phones will be available on the market starting Q1 2014,” added Wang Jiyang. As the biggest SMT and electronic manufacturing event in Asia, NEPCON China has become the barometer of the domestic makers. In the three-day event, a range of new technologies, products, and solutions will be on show, covering SMT , electronic manufacturing automation, ESD and purification, soldering, test and measurement, barcode, electronic manufacturing service, and other SMT and electronic manufacturing-related applications. The event will also provide a one-stop procurement platform for modern electronic manufacturers seeking upgrade and scale-up, while on-site industry insights and market intelligence will provide key direction for the businesses. The NEPCONseries of events have achieved big in the industry, not only providing insights on development direction, but also satisfying the needs of both the customers and exhibitors. Given the 4G momentum, NEPCON China 2014 will provide a range of interactive sessions (including forums) to hear the voice of the industry and provide better services to customers and exhibitors alike. Also, for professional visitors (telecommunications equipment makers, test equipment providers, mobile equipment makers, digital computing players, and other 4G players), the event will work hard to invite their expected exhibitors to create business match-up that serve the need for 4G procurement. NEPCON China 2014 will take place at Shanghai World Expo Exhibition and Convention Center 23-25 April, 2014. In the exhibition area of 25,000 sq meters, more than 500 leading companies from 22 countries and regions will demonstrate their products. Gathering under the theme of “Big Players for the Future” will be many industry leaders, including Fuji Machine, Hitachi, JUKI, Panasonic, Samsung Techwin, ASM (Siplace), Yamaha, Universal, Europlacer, Mydata, ASYS, DEK, Speedline, Kurtz ersa, Nordson, BTU, Rehm Thermal, DEK, Henkel Loctite, Indium, KIC International, OK International,AIM,Tamura, Musashi, Heller ,ZESTRON, Agilent, Dage, Parmi, Koh Young, Mirtec, Omron, Shimazu, TRI, Scienscope,Magic Ray, and ViTrox. More than 21,000 professional visitors are expected at the event. 4G brings about a sea change of the whole electronic manufacturing industry. The NEPCON organizer hopes the event will grow to be the one-stop industry platform leveraging the opportunity unleased by the 4G wave, a platform that demonstrates the state of the art, facilitates procurement, and promotes information sharing.